The Bridge, The Escapist's pick for Best Platformer of 2013, will be hitting consoles later this month. 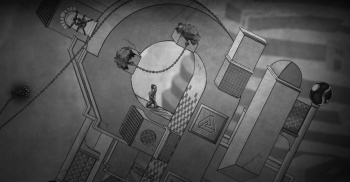 The Escher-inspired 2013 platformer The Bridge will be releasing for consoles later this month according to developer Ty Taylor. In 2013, The Escapist awarded The Bridge the honor of Best Platformer of 2013, with our current Editor-in-chief Josh Vanderwall saying "What it lacks in hype, The Bridge more than makes up for in unique gameplay and stunning visuals. Forging a world inspired largely by the works of M.C. Escher, this game will have your head spinning from the outset. Each level takes you into another Escher-like puzzle room, where you'll have to manipulate the world around you to complete the objectives. It's not a traditional platformer - there's not even a jump button - but The Bridge offers more innovation to the genre than I've seen in recent memory." The Bridge began as a collaboration between developer Ty Taylor and artist Mario CastaÃ±eda as a project at Case Western Reserve University. Work on the game continued following graduation, with the duo working to turn the school project into a professional-quality indie game. "The Bridge is a 2D logic puzzle game that forces you to reevaluate your preconceptions of physics and perspective," the game's product description reads. "It is Isaac Newton meets M. C. Escher. Manipulate gravity to redefine the ceiling as the floor while venturing through impossible architectures. Explore increasingly difficult worlds, each uniquely detailed and designed to leave you with a pronounced sense of intellectual accomplishment." The Bridge will be releasing on Xbox One on August 14th, on PS3, PS4, PS Vita, and Ouya on August 18th, and on Wii U on August 20th.